Captivating Solar Panel Project has once again rolled out in Western China. This year 59 families living in high and cold environments benefited from receiving solar panels. Prior to the panels being installed, their supply of electricity was inconsistent and costly. Mornings mostly consisted of milking the yaks in the dark. Cooking, eating, reading and writing was either done in the dark or by candle light. But now – things are so different. These solar panels provide many benefits for a family: children can study longer at night with good lighting without toxic fumes or straining eyes; families can conveniently boil water resulting in improved hydration and hygiene; women and children will now save several hours a week not having to collect so much wood/sticks to build fires to boil water or cook food; and it’s now safer for activities to happen after dark because of access to better light. You can see in these photos the difference proper lighting makes. You might also notice that although there is sufficient light, the children are still used to having their eyes very close to the page to see – something that will now improve. 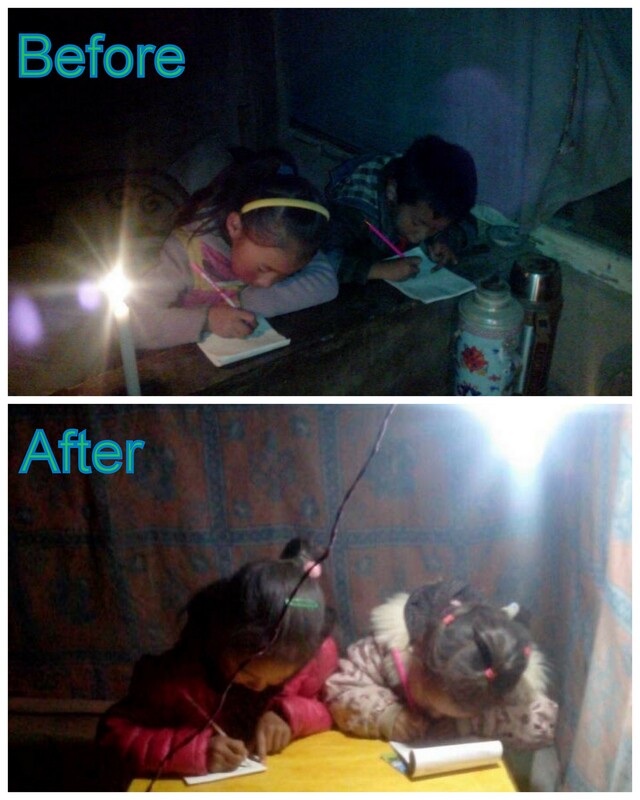 One comment from a mom said, “Tonight, when I turn on the light switch and cook dinner on my electric stove, I am grateful for stable electricity and for a bright environment for my children to learn and grow”. Our thanks to the Shenzhen Captivating Annual Charity Auction for funding much of this project. Our thanks also to Rob and several other employees from APPLE who got behind this work. Rob, not only do we appreciate your financial support, but also your assistance is helping CAPTIVATING become an approved gift matching charity recipient of APPLE Inc. If you would like to fund your very own project with Captivating, contact andrewc@captivating.org. He’d love to hear from you and has a long list of project possibilities aimed at bringing hope to children in need of your help. If you’re an Apple employee and would like to learn more about Captivating and our projects, we’d love to hear from you.